If there’s one thing I love about cooking, it’s the endless possibilities of combining ingredients to achieve a unique flavor. I was browsing the contents of our refrigerator this afternoon and I found a couple of “cookables”. I decided to make my own Macaroni Meat Sauce. 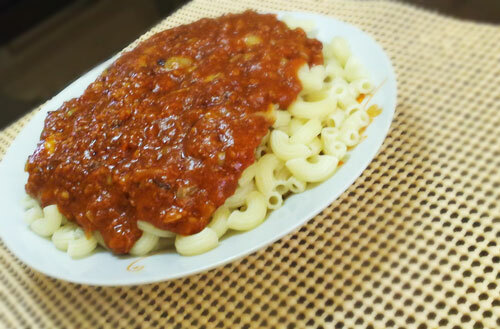 Cook the macaroni for 15 minutes in a hot boiling water with 1 teaspoon of rock salt. After cooking the pasta, drain the water using a strainer and set aside. Saute garlic and chopped onions in a sauce pan. Add the garlic beef and simmer until cook. Add last night’s leftover tomato sauce. *This part makes the sauce “ala Yagit”. Mix last night’s leftover tomato sauce with the beef. Add some grated cheddar or Parmesan cheese. Simmer for 5 minutes or until the cheese has melted. Pour the meat sauce on top of the pasta. [optional] Add some flaked chilis for extra spice. This entry was posted by Winston Almendras, who has written 6 posts as nitrosaint, on Saturday, March 7th, 2009 at 6:27 am and was filed under Original Recipes. hahaha… di pa sponsor pero sana magsponsor sila. hahahaha. 😀 McCormick McCormick McCormick McCormick McCormick McCormick! Koya, there’s more to spices than garlic and pepper. Try to experiment with rosemary, oregano, basil, cumin and cilantro. Your recipe looks good. Penge! Wow Nyok ang saya naman hehe sana magsponsor ang McCormick!